The Snack, Nut and Crisp Manufacturers Association (SNACMA) is the trade association for the savoury snack food industry in the UK. SNACMA membership includes the main savoury snack manufacturers operating in the UK market. SNACMA requested a modern CMS site to replace their existing non-responsive offering. News of our succesful work on the Potato Processors Association (PPA) site, prompted SNACMAs initial enquiry, and we were delighted to work with their industry once again. 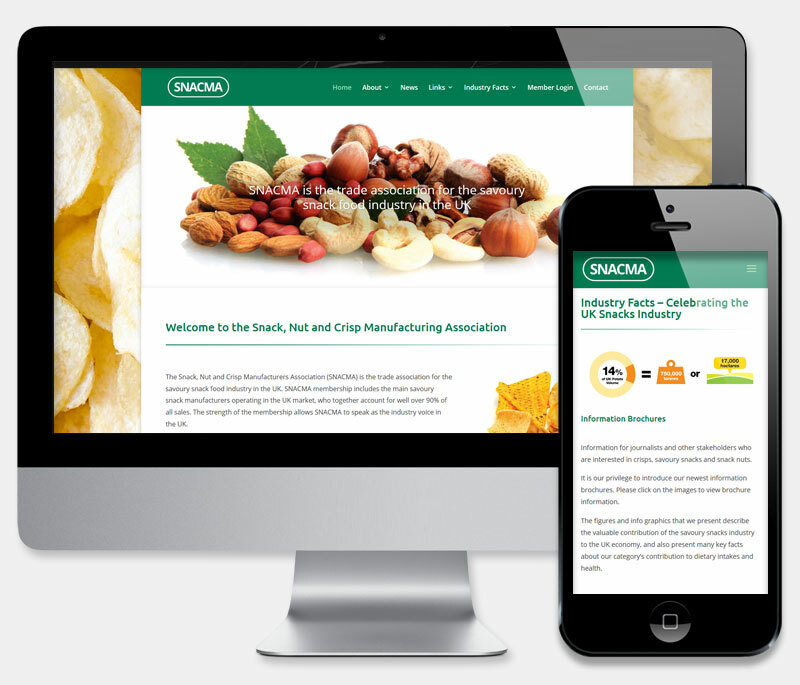 Along with the expectation for a modern clean, responsive and user friendly online experience, SNACMA also required a password protected membership area and a redesign of their existing Logo. Our supplied solution allows delivery of all key industry information in a light and easy to navigate site. The mobile friendly layout works across all devices and storage and retrieval of the required private content is dealt with using the same intuitive CMS interface, ensuring that all site content and membership accounts can be maintained by the client. The supplied product included a complimentay CMS training session, while 9-5 technical support, security updates (and additional peace of mind) are taken care off with our cost effective hosting package. It was a pleasure to work with Dee and colleagues who recently redesigned and updated our corporate website to enable it to be viewed on multiple platforms. The content was quickly developed, but looks incredibly polished. Dee has been easy to communicate with and quick to respond to change requests. As with others posting here, we've have loads of great feedback on the new look site.